It has been more than six months of bicycling to work and have done minimal bike maintenace. The most extensive work is pumping up the tires ever couple of months. But recently while on the train, I noticed there was a rip in the tread of the tire tread, so that it formed a flap on the tread. 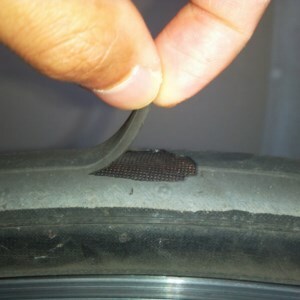 Additionally, revealed under the tread flap is a sort of mesh material. I have no idea how long the tire tread has been ripped or how many miles the tires have gone before I aquired it. But the bike and tires have held up for the three weeks after I discovered the tear (on my well paved bike route). Regardless of the history, a tire fix or replacement is in store for the near future. My first instinct, as a beginner cyclist, is to glue down the flap with superglue, rubber cement, or some type of glue. I'm not sure what would work best, without further damging the tire. The tire still has enough tread for my relatively short route, so throwing out this tire is a waste of material and money. I looked online for solutions to my tire rip, but didn't find good results. So I decided to ask my coworker, who is an avid bike rider. He advised me to replace the tire for safety reasons to avoid a blown out tire result in a LONG walk home or to work. Hoping for a different answer, I had him take a quick look at the bike tire when he showed me the tool use to remove a bike tire. To my surprised, he proceeded to recommend vulcanizing glue, which he also had in his patch kit. Online, the price for a patch kit was low cost and perfect for experiment. I've applied the glue to the tire. If all goes well, the glue will hold and I won't have any further issues with the tire!